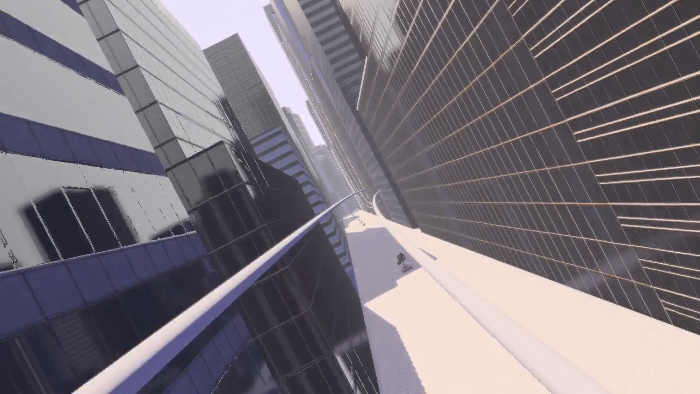 This demo is a rollercoaster for the Oculus Rift. 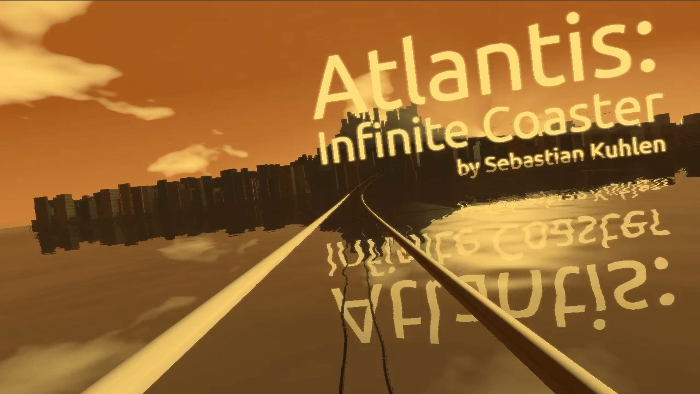 You will enjoy a fast ride through the streets of a huge city afloat on an endless ocean. 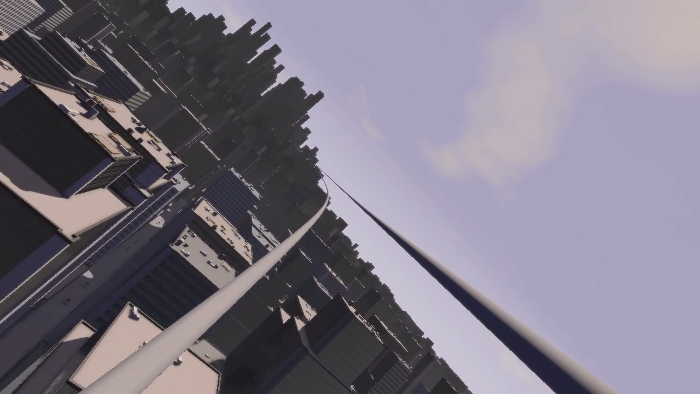 The city as well as the track are generated randomly, so the layout will be slightly different on each start and the ride is infinite as the track will be extended again and again. Note, that this is fast-paced experience. If you are new to the Rift, you should probably try a "slow" sit-and-look game first. Also, please stop if you feel uncomfortable, especially as the experience will not stop on its own. Multithreaded loading reorganized to avoid excessive context switching. This fixes a possible race condition and an OpenGL crash on some GPUs (i.e. GTX770?) - Thanks for trying out all these test versions, Pascal! Fixed gamma correction of loader (mostly sharper fonts). If you encounter any bugs, please report them in the corresponding thread of the Oculus Forum or contact me via email. As the track generation is still very simple, collisions with buildings will occur on almost every ride. Therefore at this moment, please, do not report collisions with buildings or sudden turns of the track. 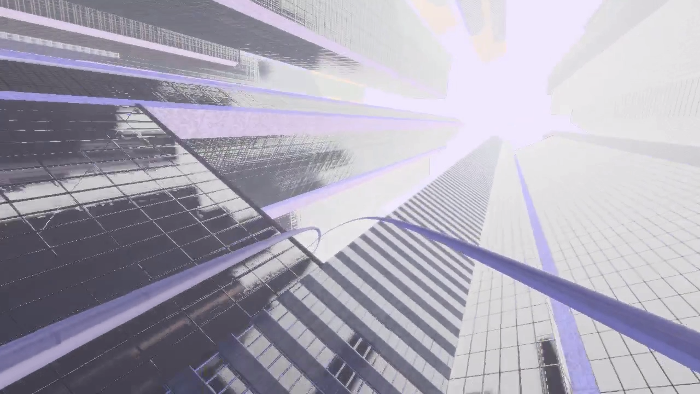 As the city and track are generated randomly, some bugs occur seldom and are difficult to reproduce. The random number generator of this demo uses a seed, which can be used to create the same set of random numbers again. This seed is written to atlantis.log, so please make sure to copy this file and send it along with the bug report. Also note, that the next start of the demo will replace this file with a new seed, so if the bug only occurs on a certain generated track, make sure to get the file before starting the demo again. For many bugs, a detailed log is very helpful. To increase the amount of information of the log file, create a custom configuration (like this) and set LogLevel to 3. Please attach the resulting atlantis.log to your bug report. When you start the game, you can choose from six different configurations. There are five presets, which represent different levels of image quality have different hardware requirements. If the demo does not run smoothly, try a lower setting. The sixth setting is used for custom configurations. This is done by editing the file atlantis.cfg with a simple text editor. Possible settings and explanations are found in the example file. You can also start from or edit the five default presets by either copying a cfg file the folder resources/config or by the corresponding file directly. Currently, the Oculus SDK does not support Direct-to-Rift mode in OpenGL, so you have to set the display mode of your Rift to extended. This demo should detect on its own, which display corresponds to your Rift. It first displays the configuration menu on your primary display and then starts the demo on the display of your Rift. If no Rift is found, it will still run, but without lens distortion and according to the resolution settings in the configuration.